So I answer the door and Postman Jim is stood there with a handful of envelopes, a small parcel and a dopey smile on his pleasant features. "It's time you cut your front lawn," he says, handing me the bundle. "Spring has come, the grass has grown and you haven't noticed. But get the lawnmower out quick, pal. It's going to rain in an hour." He sounds confident and I'm puzzled. Jim has had many jobs but weather forecaster is not one of them, I'm sure. "Look up son," I say. "See all that blue? That's a cloudless sky. It will not rain today, Jim." "It will and I'll tell you how I know," he says. "It won't and I got to get back to work," I say, making to close the door. "It's postman's lore," he says, reaching out and sticking his foot in to stop me. "Centuries of walking the streets and watching the weather. Two things tell us rain's on the way. One is when the wind gets up out of nowhere. But plenty of people know that. The other is stranger." "You're walking along and suddenly you start to sweat. An hour later the rain begins to fall. Always. We can't explain it. But centuries of delivering the mail, in sun, hail, rain or snow, tell us it's true." "You are starting to sound mystical and mysterious," I say. "But you are only a village postman on a bike." "I'm more than that," he says. "The postman is the unsung hero of the age." "You are not unsung," I say. "I can think of three songs about postmen without trying." "Don't give me Postman Pat," he says. "Or your letters are going next door for a month." "Return to Sender," I say and break into song. "I gave a letter to the postman. He put it his sack. Bright and early next morning, he brought my letter back." "You have a rare talent," he says. "But it's not singing. Any others?" "There must be some word today," I sing. "From my girlfriend so far away." "Please mister postman look and see," Jim sings back. "If there's a letter, a letter for me. "Good song," he says. "But it's about a lovelorn guy and his letters. The postman is peripheral. Gimme one song where the mailman is the main character." "I can but I don't want to," I say. "It's lyrical and romantic. I know you. Listen to this song once and you will wander forever with its words in your head, yearning for a past that never existed." "Lemme hear it," he says. "I glide along these trails like a falcon in the sky," I sing and he smiles. "I'll get this mail to California or I'll die. Over the mountains with all the speed that I possess. 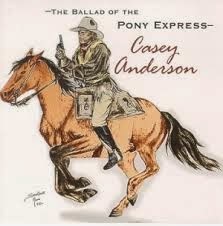 I carry the pride of the Pony Express." "I love it," he says. "That is me." "That is not you," I say. "You are a village postman on a bike." "Only if your eyes are misted by too much reality," he says and sings the verse. "I miss my darling Eleanor. She's back in Kansas, bracing for the war. If I can keep on riding, and not end up lame or dead. I'll have enough saved up so we can finally wed."
"So you do know the song," I say. "It is my song," Jim says and turns to leave as the raindrops start to fall.